How are those jumps coming on and who has joined the forward loop club? I hope you are moving on up and this month I am looking to equip you with more wave skills in order to get the best out of moderate surf by ‘Working the Waves’. 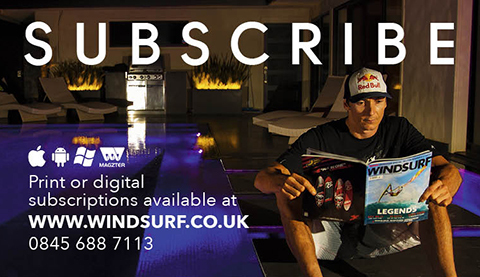 I started musing on the ideas for this feature after reflecting on what I had learnt from coaching and sailing in the waves of Jeri, Brazil, at the upwind beach break that actually feels like some of the spots back at home on the south coast of the UK. The conditions there are not always amazing, they are side to side on shore with small to medium waves, but they are fun and you get a lot out of them and improve if you follow some key guidelines, which I will detail herein. One of the key points in moderate surf is finding the best set waves to ride and then adding the skill of tacking or gybing on to these waves, as on smaller days you never know when another good wave will come. If you are looking for a good wave to ride then these will often come in sets and they will have 2 – 3 waves in the set and they will be defined from quite a distance away and look longer and steeper. On the way back in you will either have turned onto a wave / swell that you have predicted may turn into something bigger and better or you will be sailing upwind looking for a swell that is forming up. As you get better you may even stop to wait for a wave outside the break! Progressing as a wavesailor is about a change in mindset – looking for waves to ride and not just blasting straight back in, seek and ye shall find. On smaller days you may have to go in and out 2-3 times before you find a decent wave to ride (and/or jump), so one of the best tips I can give you is to go through what I call the ‘stunt zone’ as many times as possible and with your eyes scanning for opportunities to, well, do stunts! What do I actually mean by this? I am saying do short reaches and again, try really hard not to blast for miles out to sea, looking for the shipping lanes. • Keep an eye out for good waves and get better at predicting whether they will peak up. • Tack or gybe onto good waves, even if you are only just past the break or maybe even only half way out. • Remember to sail where the action is, looking up and downwind to assess for the best peaks and take the tide into consideration. On these small wave, side to side onshore sessions, there are often opportunities to waveride both upwind and downwind, called backside and frontside respectively. Now before you go charging off trying to ride these waves, your first bit of strategy is to actually enjoy being on them unhooked and find where the energy is and then look up and down the wave to see which part is breaking better, like jumping, you are looking for the best bits of the wave to use to have fun on. In these small wave sessions you may be on a good wave, but actually the best part of it may be way upwind or downwind so you have to be very observant and get yourself to the peak. These waves will also bend slightly, either towards or away from you, and so you will have to mix up both back and frontside turns so let’s look at these next. Here are some basic tips to ride backside upwind. 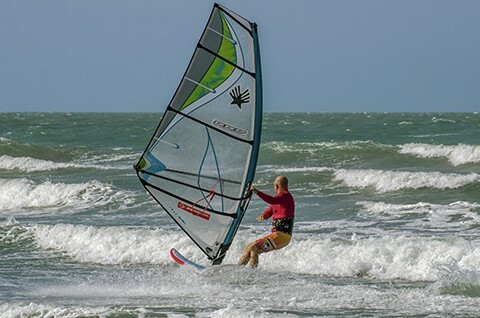 • For the first few waves just look to work with the wave changing the boards direction through heel and toe pressure heading upwind, whilst unhooked. 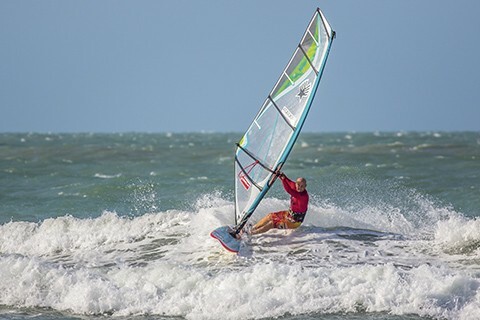 • Now start at the top of the wave and drop down it and carve upwind on your heels to initiate your ‘bottom turn’ in order to get back up the wave. • As you carve, move rig back and body forward to keep speed. • Look upwind to carve upwind and then look down wind and down wave to carve back down the wave. • As you progress aim to carve the board harder at the bottom to get back up the wave so you can hit a steeper, more throwing part of it. • To really smash the wave, you have to fall over hard on your toeside and almost backwind the rig as you really turn your head to redirect you. • Jedi tip: as you improve, look to get a backside hit which helps you redirect the board to then get frontside. Let the wave help you and work with its power and flow. 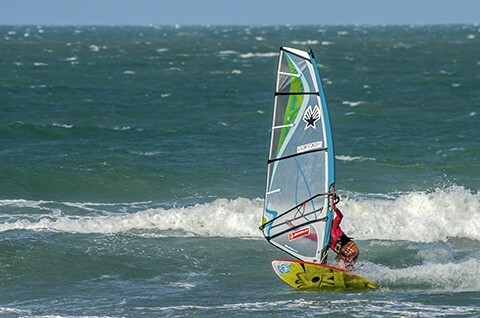 Riding downwind or down the line is a bit more challenging than backside riding and it can be described as gybing off the wind with both feet in the straps and then turning back upwind, all whilst on, or in proximity to the breaking wave. Gybing skills come to the fore here and how you gybe is definitely how you waveride, so look to ensure you are competent and working hard at your step gybes. • Essentially you are turning the board again with your toes and heels and this time you begin on your toeside and then carve on your heelside to turn back upwind and drop back down the wave. Your timing will improve, just go with it. 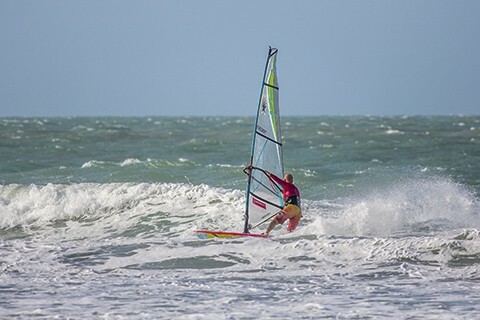 • Start at the top of the wave and drop down it and carve downwind by getting the rig forward and carving hard off your toes, really bending your ankles. Your hand slides WAY down the boom just like a gybe. • In order to get back up the wave you have to open the sail and get more weight on your carving back foot as you swing your hips to the inside of the turn. 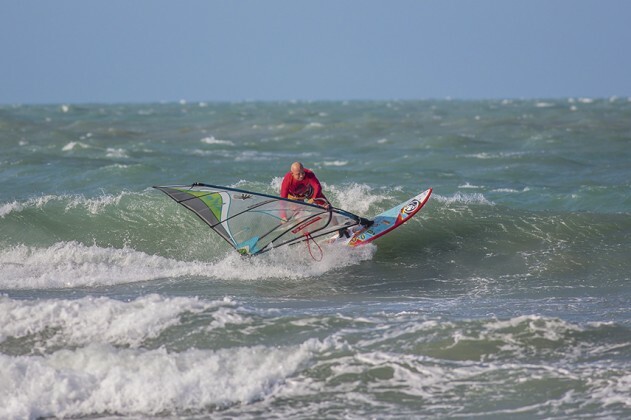 • Keep the carving pressure up and aim to get up the wave to a steep section and then turn your head and bring your hands back together as you transfer the weight to your heels to turn back upwind. • Jedi tip: if you want to turn tight and vertical, then throw the rig forward and get it open as you get your hips down and arse back and to the inside, this will allow you to carve more on the back foot and the rigs forward position will keep the board flat. • Look to use an upwind peak to bank off and really throw the sail more open to keep the wind in it. • If you have a steeper peak then hit it and use its energy. Getting back and high on the wave will give you the position to drop down it, gain speed and make a better frontside turn. 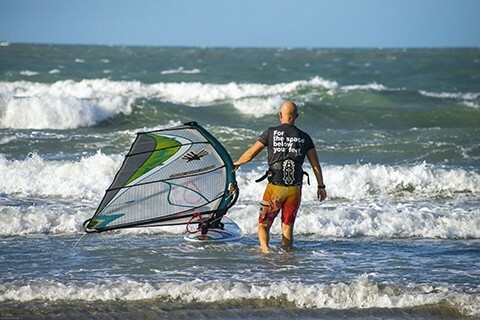 • If the upwind peak is quite shallow, then be more subtle in redirecting frontside and as you drop down the wave, get that rig forward and relatively open. • For the top turn, ensure you get the rig forward and away from you so as not to oversheet the sail. This is all made easier by getting your back hand back up the boom and really turning your head to look back upwind good and early. • Jedi tip: go hit the section. You will either get a great hit/turn or you will learn that you need to go earlier or later, or get your weight more forward. Charge, carve, hit, repeat! Generous straps and long lines as ever. A big enough board and sail to get you going on the inside. Rig for the action zone not for out the back!